Synopsis: Young Phyllis Allenby (June Lockhart) is preparing for her marriage to attorney Barry Lanfield (Don Porter). Barry is the perfect candidate for marriage: handsome, patient, understanding, and (last but not least) wealthy. 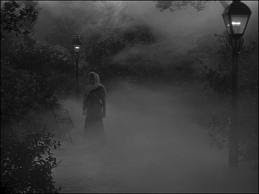 But Phyllis is deeply troubled, because a bizarre series of murders has been taking place in the park near the Allenby estate. The method of the killings suggest an animal attack, and Phyllis mutters fearfully about a return of the "Allenby Curse". Meanwhile, Phyllis' cousin Carol Winthrop (Jan Wiley) is caught by her mother, Martha Winthrop (Sara Haden) trying to send a letter to a boyfriend across town. Martha warns Carol that she can never have anything to do with young Dwight Severn (Martin Kosleck), reminding her that Dwight is penniless. She reveals something that no one else seems to know -- that neither she nor Carol is related by blood to Phyllis Allenby. Martha has been the family housekeeper for decades and it is now taken on faith that she and Carol are members of the family. Now that Phyllis is the sole remaining heir of the Allenby estate, Martha and Carol are in a precarious position, at risk of losing everything -- if Phyllis marries. But if Carol were to marry Lanfield instead, matters would improve considerably for both Carol and Martha. Unorthodox Detective Latham of Scotland Yard is convinced that the park murders are the work of a werewolf, a theory rejected by hidebound Inspector Pierce (Dennis Hoey). In fact, the only person who seems to buy into the werewolf theory is Phyllis herself, who explains to Aunt Martha that the Allenby Curse dooms members of her family to turn into ravenous wolves, an affliction for which there is no cure. Aunt Martha tries to convince Phyllis that it's all in her head, but Phyllis knows that each morning her slippers are caked with mud, her dress sodden and torn, and her hands covered with blood. Comments: Well, here I was, all revved up to write at length about the psychosexual implications of a young, repressed Victorian woman turning into a feral wolf as the date of her wedding approached. But no. This movie slapped my hand like a buttoned-up schoolmarm. 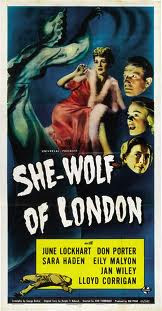 She-Wolf Of London is often cited as the last in Universal's cycle of werewolf movies from the 1940s. But that's misleading. It isn't a straightforward werewolf movie at all. Rather, it's an apparent attempt to cash in on two popular movies that had come out a few years earlier: Gaslight (1943), starring Charles Boyer and Ingrid Bergman, and Cat People (1942), starring Simone Simon. She-Wolf of London never captures the air of psychological menace that the former achieved, nor does it manage to build the self-contained world of dread found in the latter. And it's too quickly churned out to offer director Jean Yarborough ( who directed House of Horrors, our feature from March 14) many opportunities for artiness or psychological complexity (although near the climax we're treated to a couple of arch camera angles, which stand out only because the balance of shots are so spare and unimaginative). 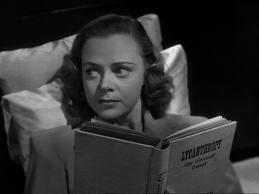 But what you ought to remember is a very young June Lockhart in the leading role. She was 20 when she starred in this picture, still more than a decade away from appearing as Timmy's mom in that curiously oedipal TV show Lassie. Lockhart isn't particularly good here -- frankly, no one is -- but that seems more the result of a rushed shooting schedule than anything else. Lockhart makes a passing attempt at a British accent, while most of the other cast members don't even try. And she does have an open, expressive look that sets her apart from other leading ladies of the time. In response to a reader request I am posting a movie trailer, which you will find above. I will try to include them when they're available, and I'll include links to the complete film if there's ever an option for me to do so. Keep them cards and letters coming folks!